Location of Waynesville in Witt County, Illinois. Waynesville is a village in DeWitt County, Illinois, United States. The population was 434 at the 2010 census. Waynesville is one of the oldest settlements in central Illinois. The area was first settled around 1825, by Prettyman Marvel and his wife, Rebecca (Barr) Marvel. They cleared an area of land near the present location of the village and were followed shortly thereafter by several other settlers. As a result, a small settlement sprung up about a mile south of Kickapoo Creek. In 1832, the first plats for the village were filed, and the name "Waynesville" (after the hero of the Revolutionary War, General Anthony Wayne) was selected. Town lots were auctioned off, and the sale announced in newspapers. However, economic circumstances meant that few lots were ever built upon. Within two or three decades, the village had reached a population of about 500, a figure where it would remain almost until the present. Sadly, Waynesville, although one of the first villages in the area, never became a prominent one. When the new county of Dewitt was established in 1839, Waynesville found itself at the far northwest corner, and thus out of the running for county seat. 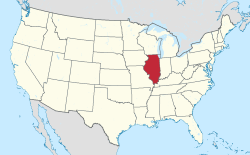 As well, influential politicians in Bloomington and Clinton managed to have the Illinois Central Railroad routed through those cities and bypassing Waynesville. Finally, when the system of state highways was laid out, the village was once again bypassed. In 1855, Waynesville suffered a cholera outbreak that killed some 50 out of the village's 150 residents: one of the worst outbreaks of the disease in central Illinois. Today, Waynesville is a slowly shrinking settlement, as younger people move away and older people die off. It no longer has a school of its own, in fact. Many of the buildings in its "uptown" business district have succumbed to the ravages of time. Waynesville is located at 40°14′30″N 89°7′30″W﻿ / ﻿40.24167°N 89.12500°W﻿ / 40.24167; -89.12500 (40.241666, -89.125081). According to the 2010 census, Waynesville has a total area of 0.32 square miles (0.83 km2), all land. Per the 2010 United States Census, Waynesville had 434 people. This includes 433 non-Hispanic White (93.5%) & 1 from two or more races. The Hispanic or Latino population included zero people. There were 184 households out of which 29.3% had children under the age of 18 living with them, 59.2% were married couples living together, 5.4% had a female householder with children & no husband present, and 26.1% were non-families. 23.4% of all households were made up of individuals. The median age was 41.8 & 17.5% were 65 years of age or older. The American Community Survey estimates 89.0% of the population were born in Illinois & 0.9% are foreign born. As of the census of 2000, there were 452 people, 185 households, and 133 families residing in the village. The population density was 1,404.0 people per square mile (545.4/km²). There were 203 housing units at an average density of 630.6 per square mile (244.9/km²). The racial makeup of the village was 98.67% White, 0.66% African American, and 0.66% from two or more races. There were 185 households out of which 30.3% had children under the age of 18 living with them, 57.8% were married couples living together, 7.0% had a female householder with no husband present, and 28.1% were non-families. 24.3% of all households were made up of individuals and 14.1% had someone living alone who was 65 years of age or older. The average household size was 2.44 and the average family size was 2.86. In the village, the population was spread out with 23.9% under the age of 18, 8.0% from 18 to 24, 27.7% from 25 to 44, 25.2% from 45 to 64, and 15.3% who were 65 years of age or older. The median age was 39 years. For every 100 females, there were 101.8 males. For every 100 females age 18 and over, there were 104.8 males. The median income for a household in the village was $40,588, and the median income for a family was $41,731. Males had a median income of $30,481 versus $22,115 for females. The per capita income for the village was $16,640. About 4.2% of families and 7.8% of the population were below the poverty line, including 11.5% of those under age 18 and 10.3% of those age 65 or over. This page was last edited on 6 May 2018, at 23:45 (UTC).